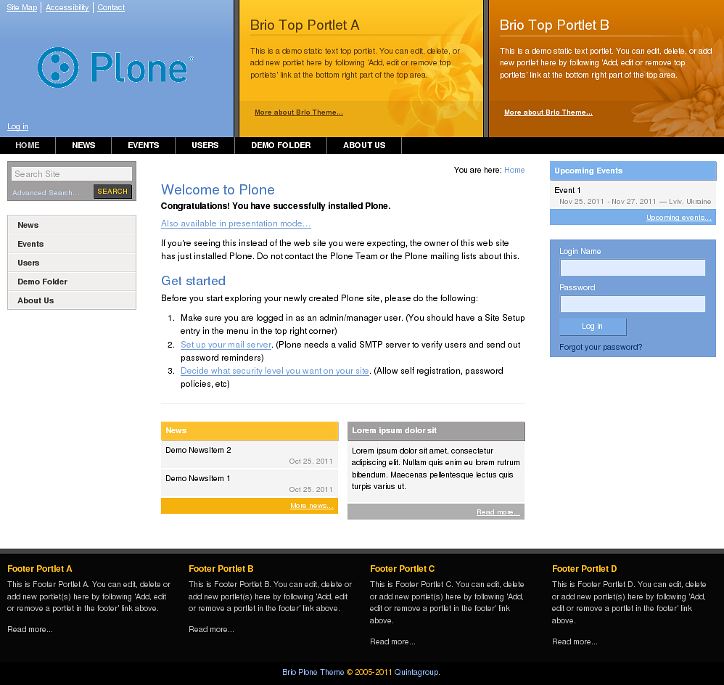 This tutorial is about Brio Plone Theme customization in Plone 4 and Plone 3, and as a diazo theme. Front page of a Plone 4.+ site with Quintagroup's Plone Brio Theme installed will approximately have the following look. Brio theme uses replaceable logo image, many editable portlets, customizable portlet background images and editable footer. Each part of this tutorial consists of several sections, in which you will find explanations about how to customize Brio Plone Theme logo, portlets, images, etc. Use navigation on the right to navigate through all tutorial sections. This tutorial consists of 3 parts, that cover Brio Premium Plone Theme customization in different Plone versions.